I love a good thunderstorm and we have had several of those lately. Watching the dark clouds gather together, forming an ominous blue-gray wall…feeling the wind pick up and the temperature drop a little…it’s my signal. As long as the lightening is not cracking directly over the house, I’m heading for the screen porch. There’s something cathartic about being in the midst of the storm. It’s like God reaches down and grabs all the ills of your world by the neck, shakes them, pounds them, drenches them and then sends them through the old fashioned ringer to squeeze out the last little bit of nastiness. Booming thunder drowns out whatever stressful thoughts are rolling around in your mind. The wind cools your skin. Your focus becomes watching for the next bolt of lightening. Then when it’s all over, there’s … silence. The air smells clean. And if the sun comes out, you just might be lucky enough to top off the whole experience with a rainbow. 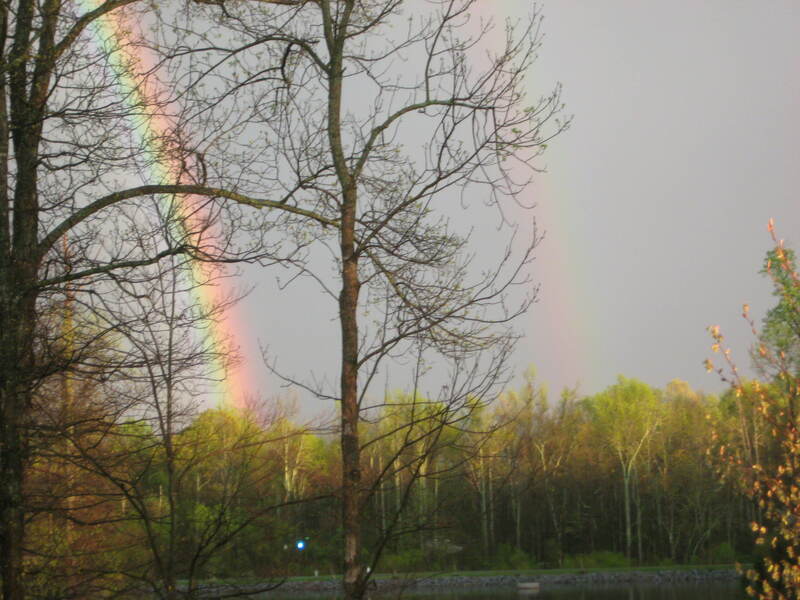 Or in the case of this particular day, a double rainbow. If you’re not afraid of thunderstorms, head for a spot where you can take advantage of the experience the next time one rolls through! Awesome – in the true sense of the word!